And here's the second 20 cm faux fur plushie for DuchessLunaire of Miepie the cat Part if the January batch, finished this Spring. 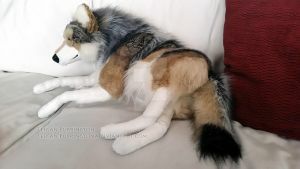 Miepie is made of high quality faux furs with tipped hairs, which gives them a realistic look, along with minky for details. The tabby markings are partially sewn in and the smaller ones are painted on with Copic markers, the white around the eyes was applied with diluted acrylic paint. She has plastic safety eyes and an embroidered nose and mouth. The tail is wired and the head is firmly stuffed, the rest of the plush is softly stuffed and cuddly I always do my best to try and make the plushies look as much like their real-life counterparts as possible, but sometimes some markings have to be a little simplified. Like that you wanted to get them close enough in look. I admire your attention to detail so much! 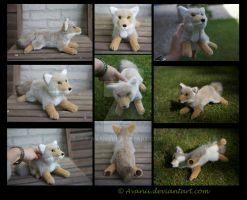 They're both so cute and look so realistic! Really amazing work. Aww both of these kitties are so cute <3 The way you did the fur makes it look very realistic! Great work! aaah!! 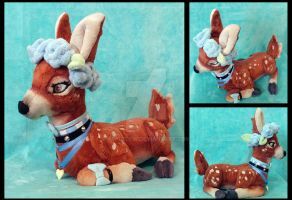 i would love one of these of my baby Crowley! how much would something like this be?